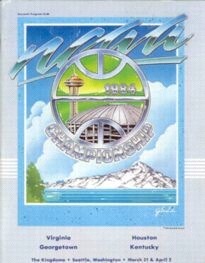 SEATTLE, March 31, 1984 -- Sometimes, their best quality is lost in the controversy that surround them and gives the impression that the Georgetown Hoyas win simply by huffing and puffing and bullying their opponents. But the Hoyas are more than bluster, as they proved again today. They are relentless, especially on defense, a part of the game that is an afterthought for some teams but is Georgetown's life-support system. The defense led a second-half comeback for a 53-40 victory from Kentucky today as the Hoyas earned a berth in the national championship game Monday night against Houston at the Kingdome. At halftime, it did not look as if the Hoyas would get that far. They trailed by 7 points, and Patrick Ewing, the 7-foot junior center, had missed the last 8 minutes 52 seconds of the half because he had drawn his third foul. 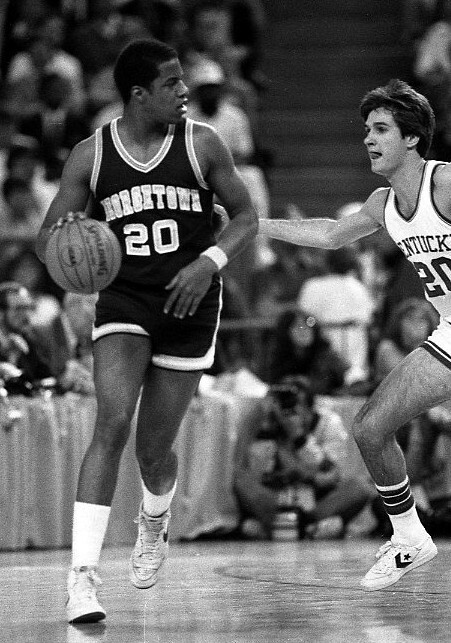 John Thompson, a big man who scowls at officials and carries a white towel over his shoulder to wipe the sweat from his face during a game, admitted that he was even more nervous than usual. "Patrick was out and I had to keep reminding our guards, 'Be patient, Patrick's on the bench,' " Thompson said. "When we got to be 10 points down, I thought about going into a delay game and trying again in the second half with the big fella." But when most teams rely on their scorers to get back into a game, Georgetown counts on tightening its grip defensively, forcing turnovers and poor shots . What it did to Kentucky in the second half today was almost sacrilegious, given the proud tradition of the school that treats basketball as if it invented the sport. Georgetown overwhelmed the Wildcats with a 12-point outburst at the start of the second half and kept them scoreless for the first 9 minutes 56 seconds. "We like to tease our enemies, make them happy and think they will blow us out," said Thompson after the game, no longer sounding nervous. "Then we come back." The key to the victory was a pressing defense that smothered Kentucky, forcing hurried shots, 15 turnovers, and prompted Joe B. Hall, the Wildcats' coach, to toss his rolled-up program over his shoulder in exasperation with four minutes to play. Kentucky made only 24.5 percent of its shots overall, and incredibly, hit only 3 of 33 attempts in the second half when none of its starters made a field goal. The 40 points were the fewest by any team in the Final Four since 1949 when Kentucky defeated Oklahoma State, 46-36, in the championship game. Today's performance had Hall groping for answers. "What happened was totally beyond me," he said. "I've never seen a team shoot like we did today. There had to be some electronic device sending out sounds around the basket." Dicky Beal, the Kentucky point guard, said it was a combination of Georgetown's defense and his team missing open shots. "It just wasn't like us out there," he said. "But credit their defense. They disguised it well and took us out of our offense." With 3:04 to play in the first half, Kentucky was in control, leading by 27-15. Ewing was on the bench with three fouls and Thompson was tempted to send him back before the game was out of reach. Instead, he implored his players on defense, substituting liberally and cutting the deficit at halftime. Perhaps Kentucky was still admiring its handiwork when the second half started. 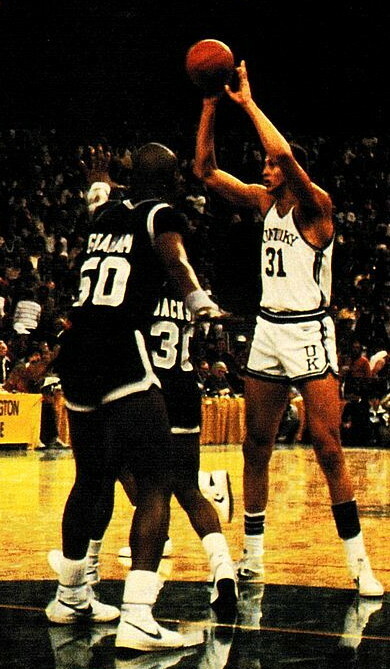 The Wildcats had been dominant inside as Sam Bowie and Melvin swatted shots and neutralized the Georgetown power game. Bowie had even stood up to the aggressive play of Ewing and forward Michael Graham minor scuffles under the basket. And Beal, Jim Master and James Blackmon, the guards, were handling the ball well. But if Kentucky was elated, Georgetown was not depressed by the score either. "We knew we had been awful," said Hoyas guard Michael Jackson. "And we knew that in the second half, Patrick would be back in there and that we would spread out defense out to the perimeter. 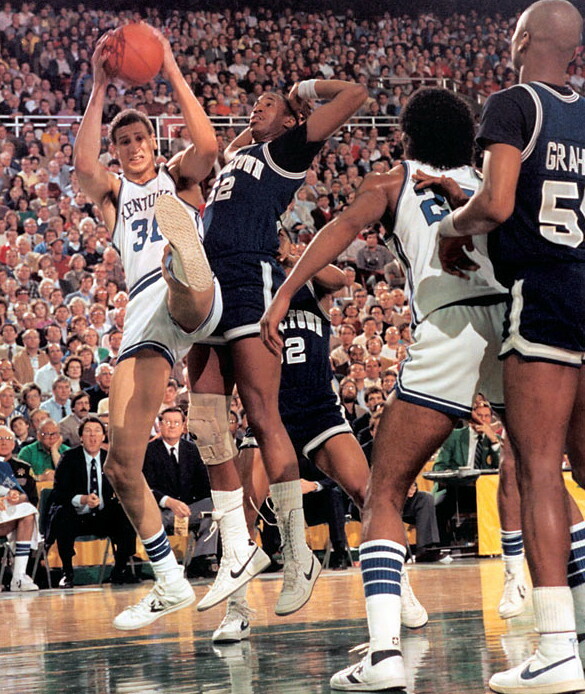 Georgetown's comeback was so swift that Hall could not counter it until his team had fallen behind. David Wingate opened the half with a jumper and Gene Smith followed with a lay-up. Then Jackson scored from outside, and the Hoyas took the lead for the first time with 17:07 remaining when Ewing tapped in a missed shot. Graham, whose inspired defensive play and rebounding were given a major share of the credit for the comeback, made a lay-up, and Horace Broadnax followed with another before Winston Bennett scored Kentucky's first points of the half with 10:04 to play. But it was just an interruption in the surge. The Hoyas continued to pressure Kentucky, forcing Bowie and Turpin to shoot long range jumpers instead of maneuvering inside for easier baskets. Hall was also upset that Turpin did not challenge Ewing, trying to draw a fourth and fifth foul. But it might not have been as easy as it looked from the bench. "We play pretty good defense," Jackson said. "I've played against our defense in practice and it gets pretty rough."